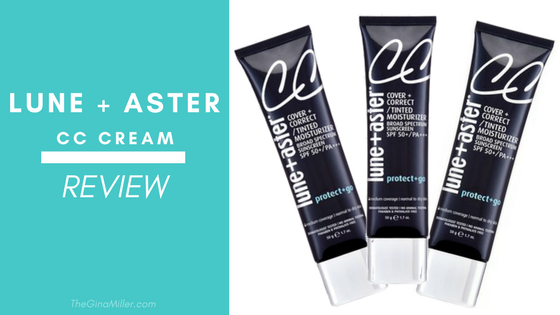 Lune & Aster CC Cream Review | Gina Miller's Blog - A working mom's blog about fitness, travel, handbags & beauty. It also protects from UVA and UVB rays. This is key. UVB rays are related to sunburns and skin cancer. UVB rays penetrate the ozone and while they don't cause sunburns, they do some serious damage. UVA rays lead to brown spots, darkening and aging because they penetrate deeper into the skin and affect the collagen. Read more in the only sunscreen article you need to read. There are a handful of moisturizers and sunscreens that do this but the reason why I like Lune + Aster's CC Cream so much is because the coverage is outstanding. I wear it on-camera all the time. With a bit of concealer it absolutely provides enough coverage to for TV work. Here's the thing: I don't wear this product in-studio. The quality of in-studio lighting and cameras require the heavy duty makeup. Click HERE for an eye makeup lesson from CBSLA makeup artist Mark Starr. This is an ideal tinted moisturizer for busy or low-maintenance women who need a quick, multitasking solution. If you're a working chick, busy mom or simply ain't got time to deal with makeup but want something that provides coverage and some sunscreen this is it. You need to be on the list...Get notified of new posts, super sales & exclusive goodies!